TAG Heuer Aquaracers are known for their quality and elegance. The WAP1110.BA0831 promises a sleek elegant design at a reasonable price. This black dial, quartz movement watch has a subdued spiral pattern. The hands and time markers are triangular metal and luminescent white. The watch has large minute numerals, and easily visible second ticks, so you can tell the time at a glance.The bracelet is made of stainless steel and looks great with the black dial . The black dial, with luminescent white, and stainless steel case and bracelet, give this watch a classic look. With this watch you can be sure it will look great for as long as you have it. In addition, you know it’s a product made to last with 300 meters of water resistance, and scratch-resistant glass. This watch comes with a date display, and anti-reflective glass treatment. Overall it is not brimming with feature, but there is nothing wrong with that. It is simply a high quality watch. There is nothing extraneous, or unwanted, and nothing to distract from the fact that it is a well made, elegant watch. Online this watch tends to sell around $1,200. For Aquaracer this is great price. You get all the quality the Aquaracer product comes with, without paying for all the extra features. For similar Aquaracers you can expect to pay just as much, if not more. If classic quality is what you are looking for than this is a good watch to get. However, it should be said that this watch is missing something that many of the other Aquaracers have. Something fun and sporty that sets it apart. Whether it is a Chronograph display, a blue dial, or an orange second hand most of Aquaracers have something fun and eye-cathing. This model has the signature thick luminescent hands, but nothing in particular that sets it apart from other models. The line between understated and plain can be a fine line. In this case plain isn’t even a bad thing. It is like a suit, flashy and fun isn’t necessarily what people are looking for, yet some may like something a bit more sporty. For example, the WAF2112.BA0806 has many of the same features, but comes with a dotted blue face, fitting it’s nautical theme, or the WAF1014.BA0822 with its Chronograph. With this watch you can be sure you will look great whether you are in a suit, or in everyday attire. 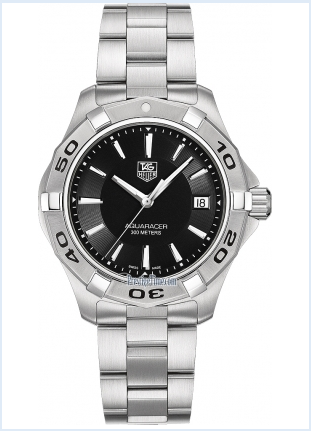 In addition it is backed with the quality of TAG heuer, and durability of the Aquaracer product name.